list since I was newly diagnosed with hypothyroidism and Hashimoto’s three and a half years ago now, but for some reason, I didn’t get round to actually buying it until a few months ago. I may reference back to this book and what I’ve learnt from it throughout my blog posts. 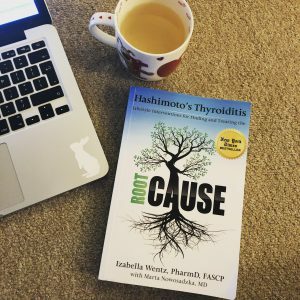 Izabella Wentz’s first book, Hashimoto’s Thyroiditis: Lifestyle Interventions for Finding and Treating the Root Cause, is essentially an extension of functional medicine. She firmly believes in the functional medicine approach. The basis of the book, as we learn in the first few chapters, is Wentz’s own notes of what did and didn’t help her back to good health with Hashimoto’s, presented in a book with the hopes that it will help others. Her passion for sharing this information is obvious in the way she writes. 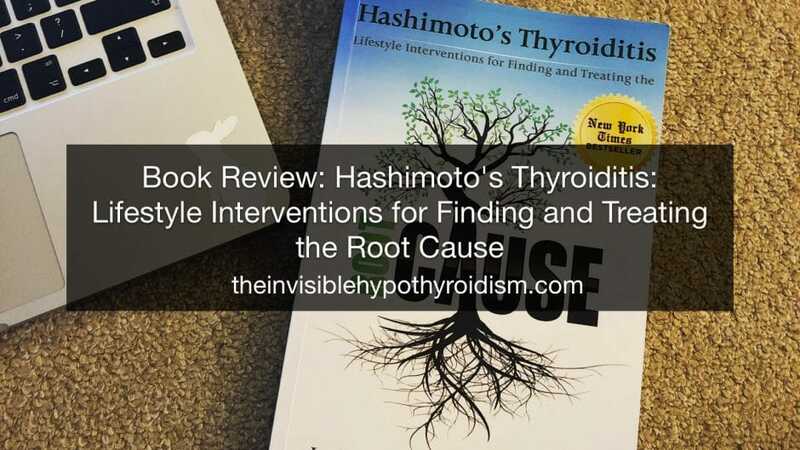 She includes her own personal journey to begin with, before giving an overview of what Hashimoto’s is and how it affects those with it, as well as tests and medications used. Her history as a pharmacist comes in useful when she discusses the different types of thyroid medications but also other medications often given alongside them to treat other thyroid symptoms left from an improperly addressed thyroid condition. She offers an insight I haven’t read from anyone else on this topic. One of her biggest concerns is around leaky gut and gut health, which she has often stated must be present trigger Hashimoto’s in the first place. A lot of the interventions she recommends and discusses having help her, revolve around improving gut health. She also looks at toxins, vitamin levels, supplements, dietary changes and triggers, exploring the reasons why Hashimoto’s is triggered or ‘turned on’ in the first place. Her philosophy makes sense – in order to recover your health with Hashimoto’s, you must address what caused it to occur in the first place. The book is heavy and honestly, it took me a few months of reading a chapter or two a week, to get through it. It’s not light reading and readers may find it useful to highlight or take notes on information they found particularly helpful. For some, it will definitely be overwhelming, as there is not only a lot of information included but it is also written in a typical medical manner. Meaning that if you’re new to understanding your thyroid condition, it may seem as if every sentence is full of jargon. So it perhaps isn’t the best book for newly diagnosed patients to begin with, or if you experience thyroid brain fog! I found it best to read and absorb it in smaller chunks. For those who are already knowledgeable in thyroid disease and keen to unearth some lifestyle interventions to help themselves, it is by all means a comprehensive book and guide. And Wentz’s personal story and experience add a layer that many other medically written books often don’t have. On the whole, it is a very comprehensive and informative book for those with Hashimoto’s, looking to read about someone’s real experience at controlling it and living an improved quality of life. I also like how she agrees with my own thoughts of each thyroid patient being unique and different interventions and adjustments working for different people. There is no one-size-fits-all after all. Next I Have Been Nominated for The Annual Bloggers Bash 2019 Awards!